Here's our rendintion of Magrat Garlick's dress in the Wyrd Sisters animation; our tribute to Terry Pratchett! 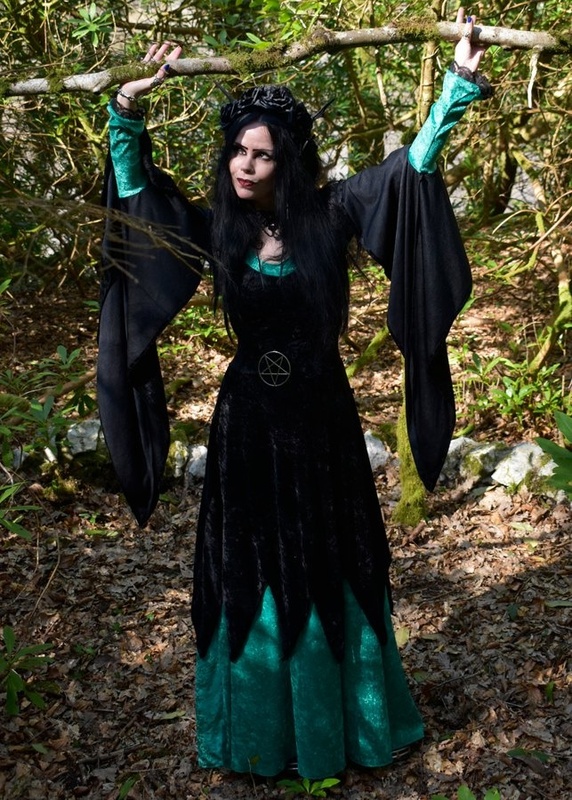 Made from crushed velvet, shown here in Black and Garlick Green, it's also available in any of our crushed velvet shades!<br> <br> There's a fitted bodice and upper sleeves, with a contrasting neckband; stripey puffed elbows, an inner cuff trimmed with lace complimented with a swishily witchy outer cuff; and a wonderfully witchy bias cut skirt with a contrast underlayer, and raggedy pixie-pointed outer! Here's our rendintion of Magrat Garlick's dress in the Wyrd Sisters animation; our tribute to Terry Pratchett! Made from crushed velvet, shown here in Black and Garlick Green, it's also available in any of our crushed velvet shades! There's a fitted bodice and upper sleeves, with a contrasting neckband; stripey puffed elbows, an inner cuff trimmed with lace complimented with a swishily witchy outer cuff; and a wonderfully witchy bias cut skirt with a contrast underlayer, and raggedy pixie-pointed outer!